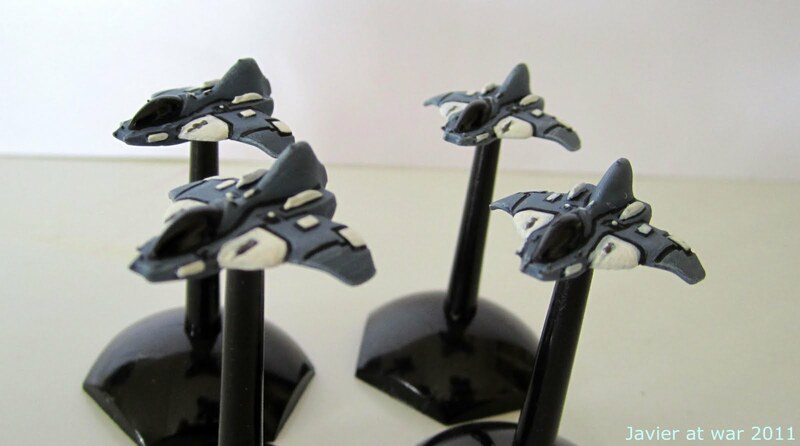 I am feeling the space ships combat bug again so I just painted some plastic EM-4 space ships from the Silent Death range, and also I dusted off some pre painted Chinese space ships that I bought in Ebay some years ago. Estoy otra vez con la fiebre del combate espacial, así que he pintado unas cuantas naves de plástico de EM-4, de la antigua game de Silent Death. También he resucitado algunas naves pre pintadas que compré en Ebay hace años. 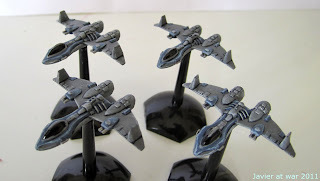 I will try with then the rules Squadron Commander Reheat from Brigade Games, and later perhaps Silent Death and the yet to be released space combat rule set from Two Hour Wargames. I also have an unfinished home brew rules that I might try some day. Las probaré con las reglas Squadron Commander Reheat de Brigade Games, y quizás más tarde pruebe Silent Death, y por supuesto las que van a salir de Two Hour Wargames. También tengo unas reglas caseras sin terminar a las que a lo mejor les doy una oportunidad. Here you can see part of the Federal or Human Fleet. I hope to make the Alien or Rebel Fleet later on. Aquí pueden ver parte de mi flota humana o de la Federación. Espero hacer más adelante una flota rebelde o pirata o alienígena. Las fotos se pueden ver más grandes si pinchas sobre ellas. Heavy fighters or medium bombers. Cazas pesados o bombarderos medios. Heavy bombers or perhaps destroyers or transports. I have to put them on individual bases. Bombarderos pesados o quizás destructores o incluso transportes. Tengo que ponerlos en bases individuales. 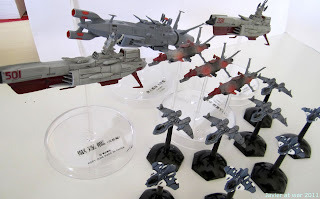 Frigates. I have to fix them to put them horizontal and on smaller bases. Fragatas. Tengo que hacer que queden horizontales y también ponerles unas bases más pequeñas. The whole fleet so far. Toda la flota hasta ahora. Last Sunday, my gaming buddy and I tried a the campaign rules for In the Emperor's name! with a Terminator vs. Genestealer cult setting. 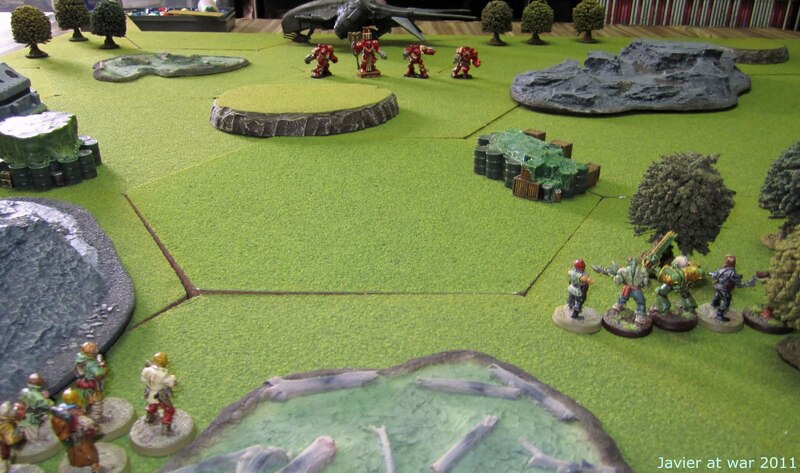 The first thing we realised was that such classic encounter of Termies vs. Genestealers is boring with ITEN rules as all of them has Grit 2+, and you have to roll 1 to kill someone, so the game become long and repetitive. My buddy suggested to use Grit 2+ only for leaders and special characters, and I think it was a good idea that we will try some other day. 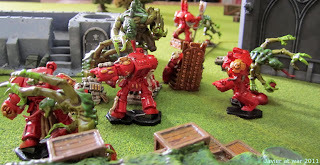 The situation of the campaign was that a Space Hulk crammed with Genestealers and perhaps some Orks, had crashed on a abandoned planet only inhabited by savages and gangers. 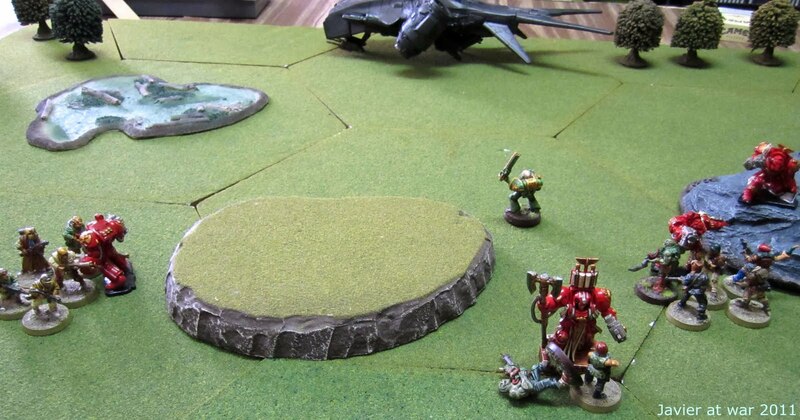 Our Librarian was almost sure that in that Space Hulk was a very powerful and long missed pre-Heresy weapon, so he set up a squad and landed near the Hulk to explore it. We rolled in the Investigation table and got "Whispers in the dark", so to keep it with the Terminator's fluff, we changed the informant for a dead Terminator which had to be retrieved. We used Termagants as Hybrids and a Tyranid Broodlord as Patriach, but with different stats. 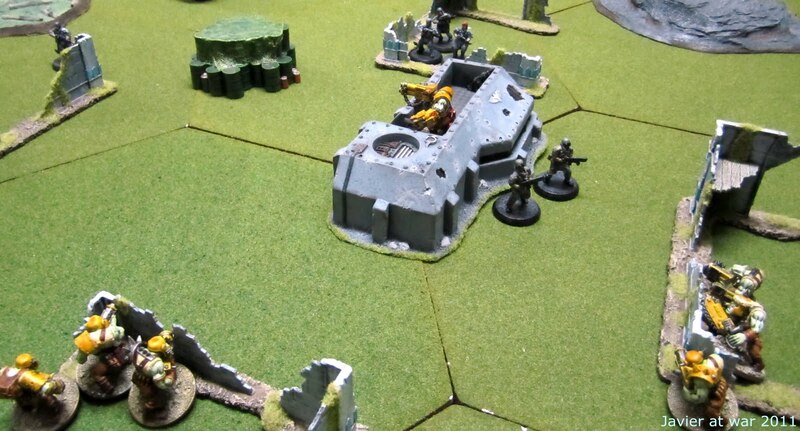 As everybody had the same Grit (2+) and penetration power (Fighting value + weapon bonus -Genestealers 5+2 and Termies 3+4-), it was hard to get some kills, and then the game derived into a general and endless melee around the objective. In the end both sides suffered almost same casualties (2 Hybrids and 1 Genestealer vs. 2 Termies) but the Genestealers' speed made them to win the day. As the Terminators had lose the scenario, they had then to fight a "Survival mission". We rolled on the appropriate chart and we got "What a piece of junk!". They had to find the supplies to repair the airspeeder whereas fight off the Agents of Chaos who were trying to destroy the ship. 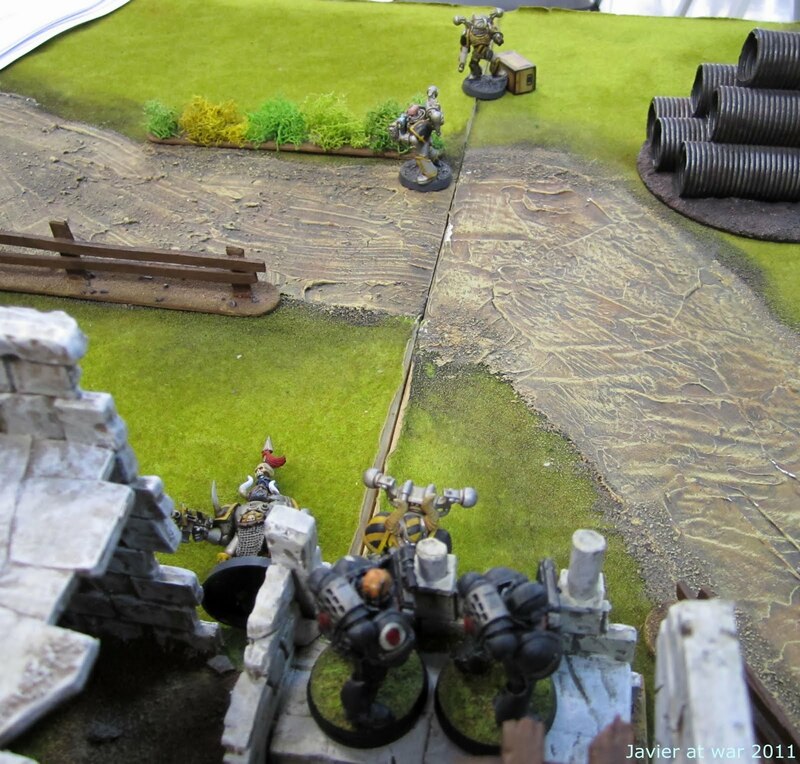 Both fallen Terminators passed a Grit roll and made it back on time for the mission. The four Termies faced thirteen gangers, fallen guards and one Chaos Space Marine. Terminators got in cover and then the agents of Chaos had to make huge Torrents of fire to have a minimum chance to kill some of them. 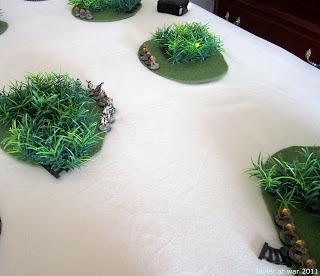 They failed and then the Termies charged into melee, each of them attacking two enemies at the same time, as this was a faster way to kill people than shooting (there is no rate of fire in ITEN). 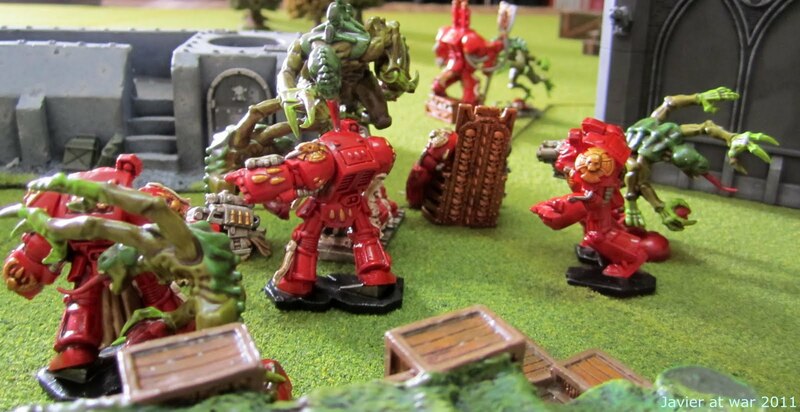 The Chaos Space Marine was the first "smart" guy to go for the ship but was shot in the back. Seeing the baddies that they could not penetrate Terminators' armour, the broke off melee and split to avoid being caught grouped. 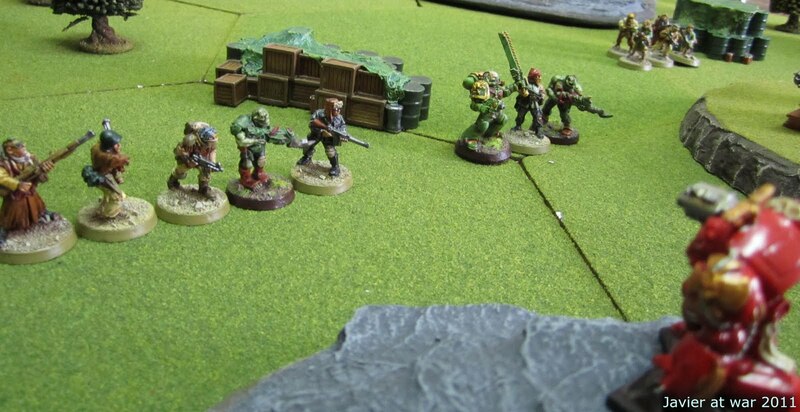 They tried to sneak through Termies line to set the satchel charge in the ship, while the Terminators chased them down like in a rabbit hunting. Well, they killed ten of them but could not finished them all, so the ship was blown away in the end and the Termies lose this mission as well. We rolled again on the Survival mission chart but we looked at the wrong chart and then we finished playing "No stone unturned" with the forces asked for "Ambushed!" LOL. Thus, there were only two Terminators to check the ruins. Now, according to the scenario, there have to be at least 24" from the Terminator's starting point to the first of the buildings, and the figure must spend one full turn investigating the building. Well, this take you four turns to do it, and the scenario has a six turn game limit; therefore we could only check two buildings. In one of them there was nothing and in the other three Genestealers. The Terminators killed them all but as he could not find any evidence in the buildings, he did not gain any Victory Points and consequently the mission was failed. 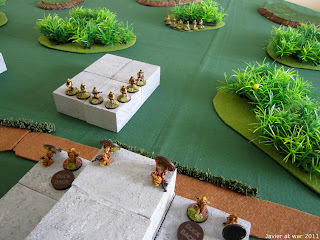 At this point we decided to quit the campaign and try a single game with different retinues containing lower Grit and different characteristics and weaponry. So we played "Kelly's heroes" with an Imperial Guard vs. a Orks retinue, and this time we had fun. 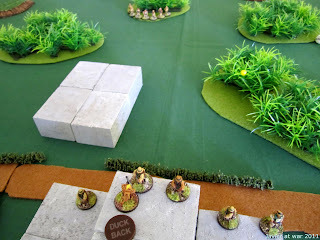 Both groups run towards the objective and when they were in range, they started to fire at each other with small Torrents of fire of two, three members each. As soon as the first casualties took place, everybody got in cover. 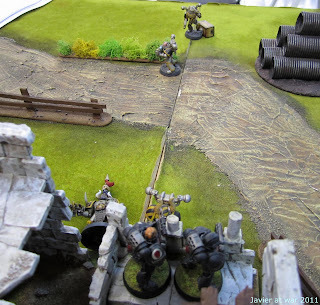 As my Orks could not run because they were seeing the enemy, they never were able to charge the enemy from cover, and when they tried to do it in the open they were massacred by the Hellguns (the two guys in the open in the picture below). This handicap turned the battle into Imperial side and the Orks were quickly overwhelmed as they could not use their strong point which was melee. Anyway, the game was fast and bloody and we enjoyed it. Here are some Fauns for my 10 mm. Labour of the Gods project. They are Satyrs from Eureka's 10 mm. fantasy range. They are all the different poses you can find in the blister. Aquí tienen algunos faunos para mi proyecto en 10 mm. de Labour of the Gods. Son de la marca australiana Eureka. Estas son todas las poses diferentes que hay en el blister. Pincha sobre las fotos para verlas más grandes. Sergeant Blacksmith made it to the base on time to let them to prepare for the imminent Rebel attack. The weather had worsened and there was no Intel or support so far; the men nervously made a defensive line on the nearby woods and set on wait for the enemy to come. Terrible inclement weather. No aircraft during the mission. 12" visibility. 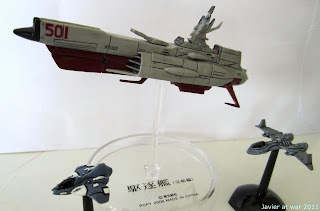 Star Army Investment Level 5. Rebel IL 2. Squad Y formed by Sgt. Blacksmith Rep 5, ASL Rep 3 and rest of the squad Rep 5. SA standard armament and armour. 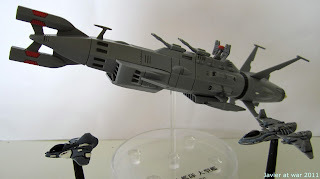 One asset with missile launcher. Squad R formed by Squad leader Rep 3 and the rest Rep 4. SA standard armament and armour. 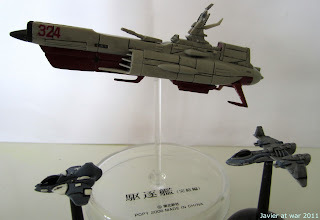 One asset with missile launcher. Turn 1. Star Army 3 - Rebels 2. The three PEFs moved. One PEF is revealed but it was a false alarm. As there was bad Intel, the situation turned to overwhelming odds and the PEFS were doubled! Turn 2. SA6 - R5. Another PEF turned into nothing and one more became a Rep 4 squad. Both sections from Y squad reacted and fired to them. Seven troopers failed their shots and Blacksmith run out of ammo! Fortunately, the ASL hit them hard with his grenade launcher, making 2 OD, 2 OOF, 2 Stun and their leader Duck Back. Turn 3. SA1 - R1. Doubles and a score lower than the enemy Investment Level, which meant a random event. A sniper! who shot at the ASL of the Red squad but failed. Turn 4. SA6 - R2. 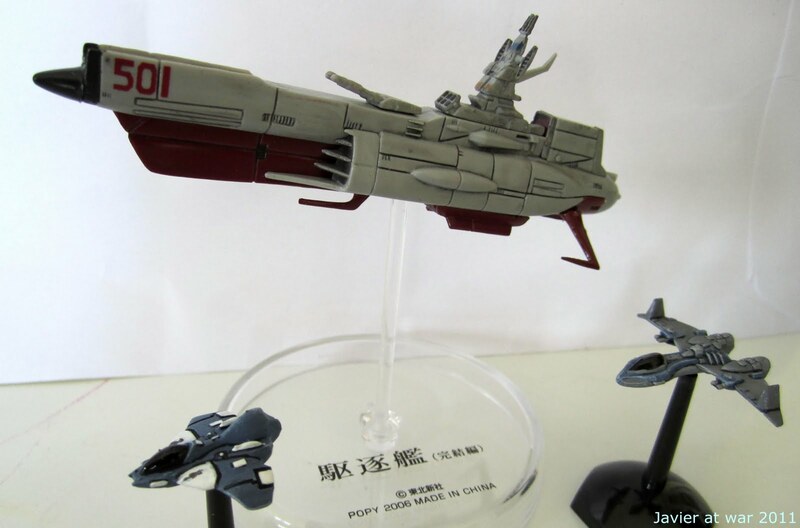 The surviving Rebel squad leader charged the SA position and was turned into pink mist by the defensive laser shots. Turn 5. SA4 - R2. SA Red squad sergeant section moved left encircling last known Rebel position. 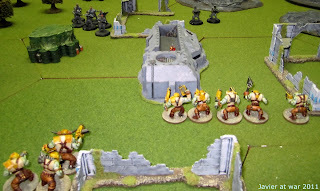 Yellow squad ASL section charged the Rebels in front of them and took them prisoners for further interrogation. Two more PEFs revealed and turned into nothing! Turn 6. SA4 - R1. All SA troops moved fast towards last PEF. Last PEF split in two. Turn 7. SA4 - R3. The activation dice scored a seven, reinforcements for the SA. They received an off board fire support, an artillery strike. 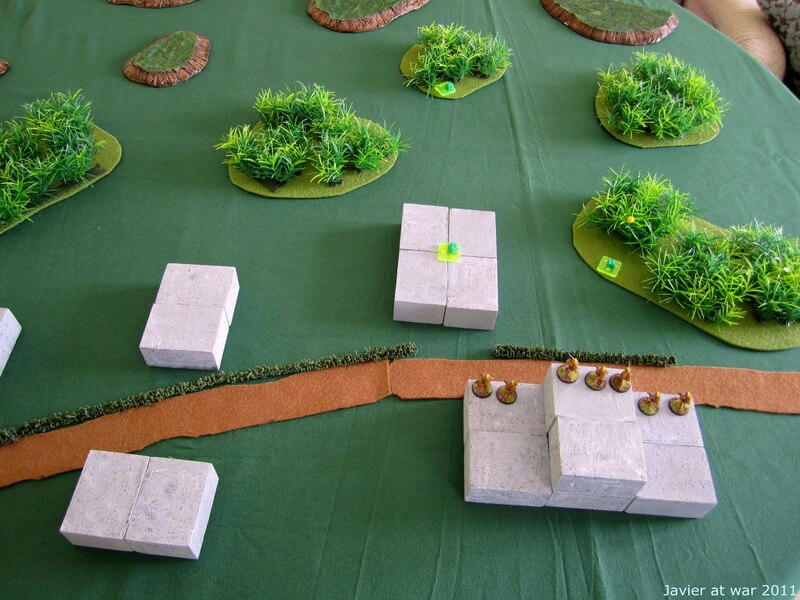 Sergeant's Red section rushed forward under the cover of a small wood and spotted both PEFs; one was a false alarm, and the other a small bunker! The bunker is small, Rep 3, with a Fire Power of 8, and SB armour. 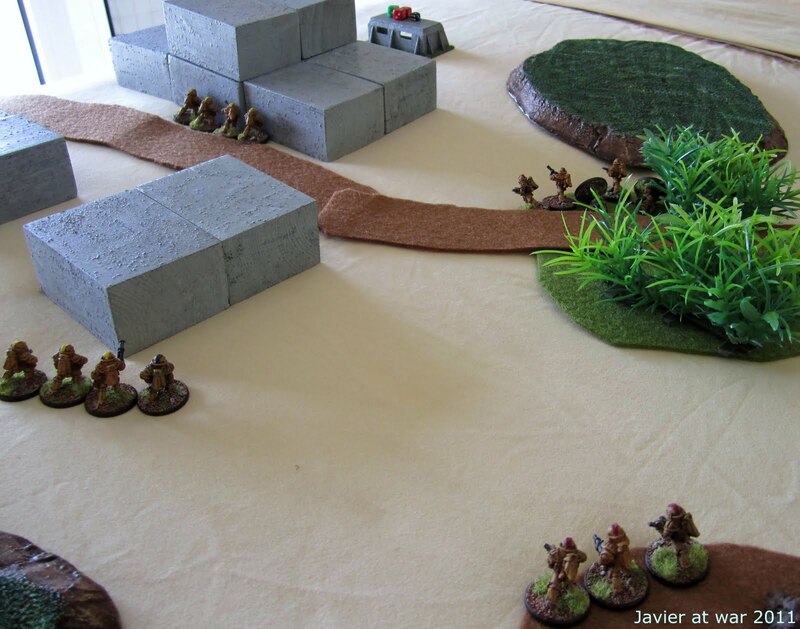 It opened fire on the Red section and let two men Stun. 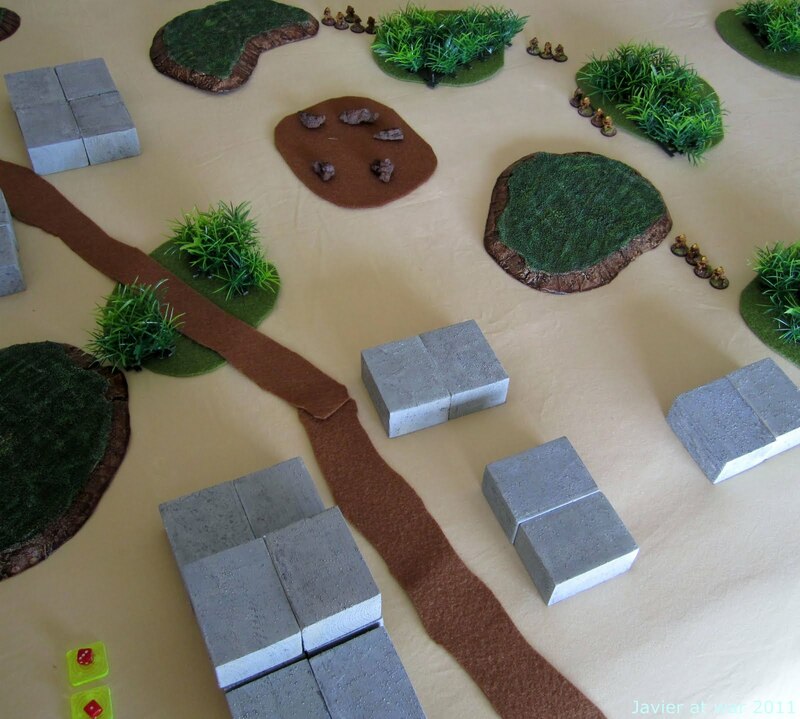 Then two men of the section with laser rifle fell backwards into the forest, and the one with the missile launcher fired at the bunker, reducing its Fire Power to three. Then the artillery strike hit home and the bunker collapsed, with all the men inside Obviously Dead. Mission accomplished. Return to base. Blacksmith gained two Fame points for this mission, so he has now a +1 Fame Point (-1+2 = +1). The SA has also gained +1 Morale campaign whereas the Rebels lose 1 Morale campaign and 1 Investment level. 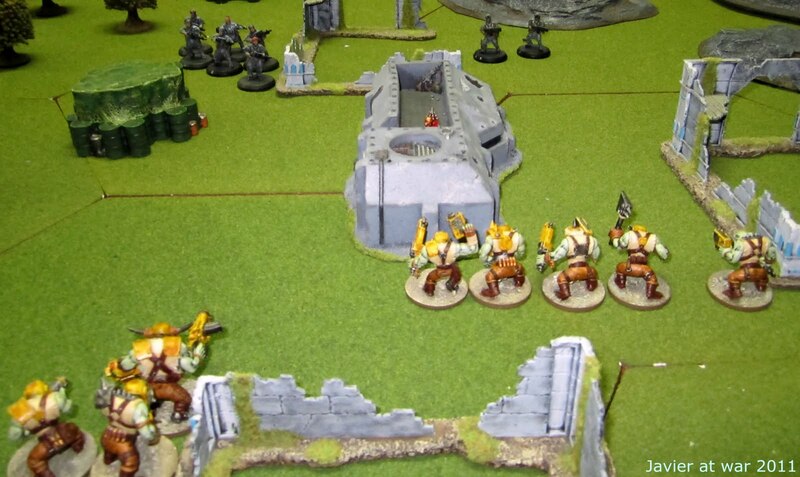 Next mission is attack and Blacksmith and his platoon are confident enough to crush definitely the Rebel uprising. 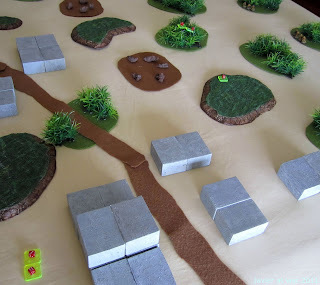 This morning I played in the local shop a game of ITEN for the first time. 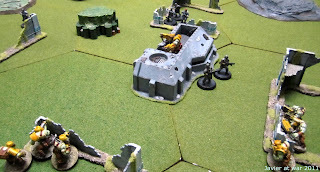 We played the scenario Kelly's heroes with a retinue of Space Marines vs. a retinue of the Iron Warriors Traitor Legion. Both squads had to retrieve an Archaic Record located in the centre of some ruins. 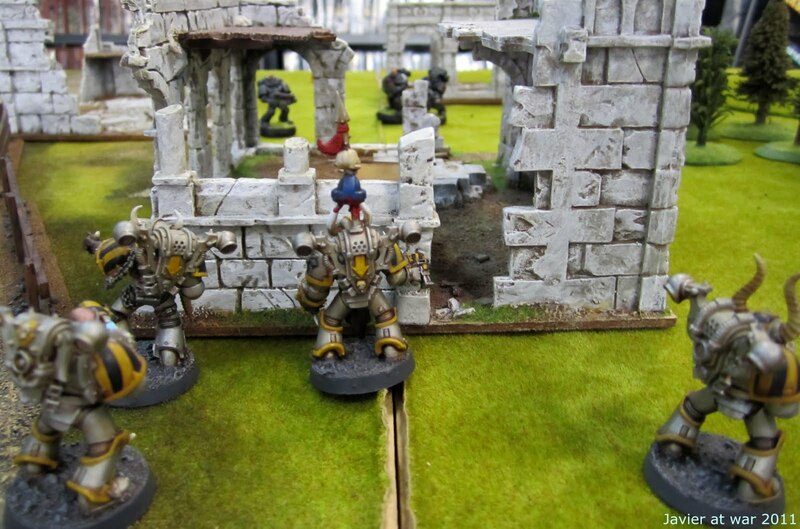 The SM retinue was formed by a sergeant with Bolter, a SM with a Plasma Gun, and three more SM with Bolters, all of them in Power Armour. 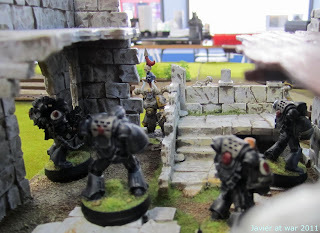 The Iron Warriors were formed by an aspiring champion with Bolter and Power Fist, one with Plasma Gun and two more with Bolters, all of them in Power Armour, and one lesser daemon with flamer. A very classic encounter between good and evil forces! In the beginning the Space Marines were cautious and this let the Traitors to reach the ruined building in the centre before them. 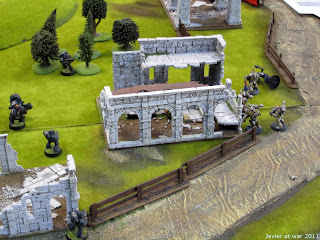 Seeing this and realizing that they could not shoot at the Traitors inside the structure, the rushed forward and made the first blood by killing the daemon on the left flank. 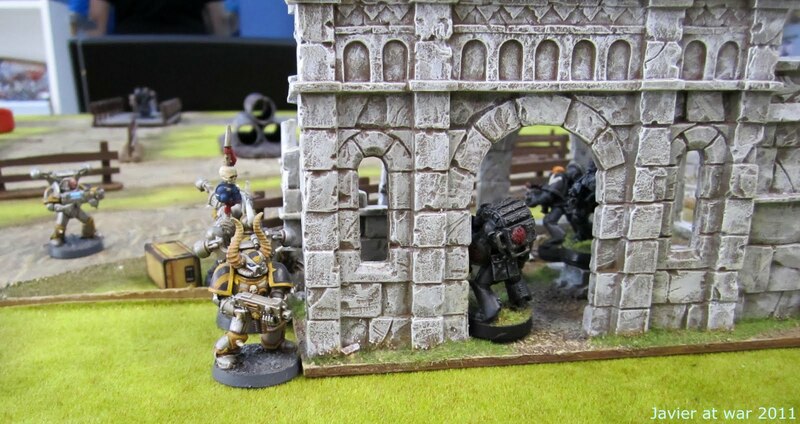 The Iron Warriors entered the house unopposed and retrieved the Archaic Record. The Space Marines then dashed into the house in hot pursuit. There were several shootouts but the Power Armour and high Grit in both sides avoided casualties. 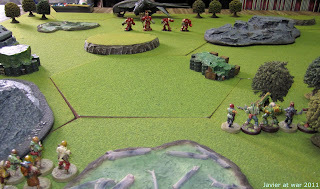 As the Traitors were escaping with the mission objective, one Space Marine run and engaged in close combat with the aspiring champion, with fatal result. Then the aspiring champion killed the Space Marine with the Plasma Gun, whereas another Iron Warrior locked in melee with a SM at the entrance of the building, and the two other run away with the Archive Record. Seeing they were leaving the area with the objective, the Space Marine charged in hand to hand combat again with the closer enemies, and threw a hand grenade to the ones escaping, but missed. The aspiring champion was stun, but when he recovered, he charged and killed the sergeant SM. The rest escaped with the Archaic Record. In the Emperor's name! is a simple (rules are 3-4 pages) and really fast game (it lasted less than half an hour), and very fun to play. Moreover, it has a very promising campaign that we will soon start to play. It is great to play again with those W40K miniatures in the Rogue Trader universe! ITEN is a free downloadable game from the guys of Forge of War and FUBAR. Gaea Prime dominance, Third Ring, planet Aesir. Its planetary colony has rebelled and proclaimed independent. The planetary Defence Force has been unable to restore order and the Star Army has been called to suppress the rebellion and purge the planet. The Army has just arrived and the situation is so chaotic that Intel is nonexistent. A SA squad under Sgt. Blacksmith has been sent on patrol near one of the insurgents areas. Star Army controlled planet. Star Army Investment Level is 5. Rebel IL is 2. Patrol on daylight and weather conditions OK.
Intel Level 4 but Bad Pre-Mission Intel. Uh, oh. This is no good. Sgt. Blacksmith, Star, Rep 5, HB armour, Rapid-Fire Laser Rifle (ME!). Assistant Squad Leader, Rep 5, HB, grenade launcher. 5 troopers Rep 4, HB, Laser Rifle. 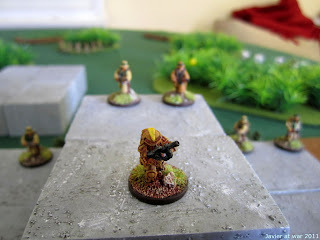 Mission: Patrol with Rebels attacking. 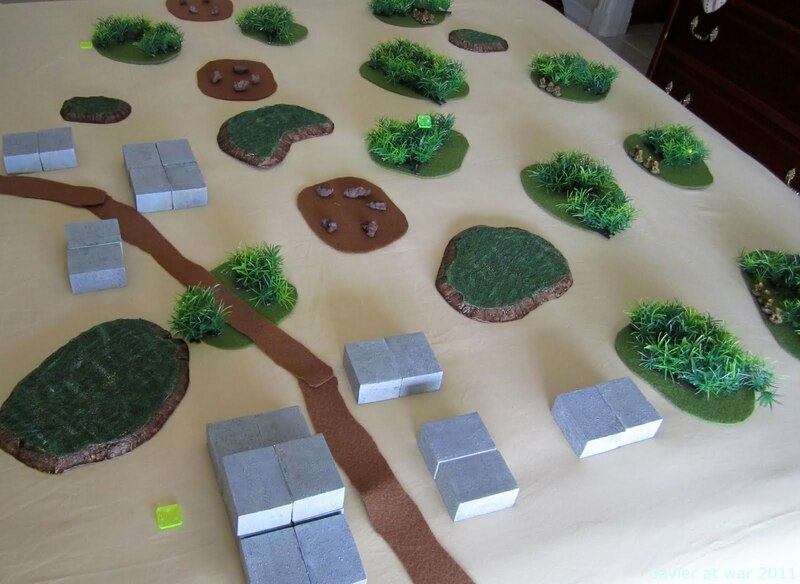 Ruleset: 5150:SA by Two Hour Wargames. Miniatures: Old 15 mm. Laserburn sci-fi range. Doubles, and lower than enemy's Intel Level. Random Event! but I ignored it as there is nobody on the board yet. Rebel PEFs activated before SA squad. The three PEFs advanced 16" towards the enemy. As there was nobody yet, I decided to move the PEFs towards the SA entry area but without entering them into it, so they got pretty close to the SA squad entry point. Blacksmith's squad entered on sector 9, rushed into a big building in front of them and then spotted the three enemy PEFs at the same time! Although there was Bad Intel, there weren't bad surprises. Moreover, the first PEF turned into nothing, but the other two resulted to be two full squads in defensive position. The closer Rebel squad (all Rep 5 except the one with the SAW, the rest wearing Assault Rifles) took the In Sight Test first, opened fire and made one Obviously Dead, one Out Of Fight, 2 Stun and three Outgunned and Duck Back (AR rate of fire outguns Laser Rifle!) OUCH! Doubles again, and this time a sniper shot the Assistant Squad Leader who was already Duck Back, and missed him. Star Army squad did not activate as their higher Rep was 5. 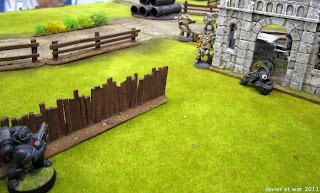 Now Rebels activated and, as they were attacking and started the turn within 12" of the enemy, they charged them. Blacksmith's men could fire at the Rebels while charging, but they couldn't because they were wounded, stun or taking cover. Nonetheless, they managed to kill two rebels when they finally rushed into the house. After that, there was the melee. It was five Rebels against 3 remaining SA troopers. The Rebels score four dice more than their enemy, so all of them resulted OOF. But as Blacksmith was a Star, he could shrug it off. There could be reinforcements on the SA side, but as the game was practically over I decided not to roll for it. 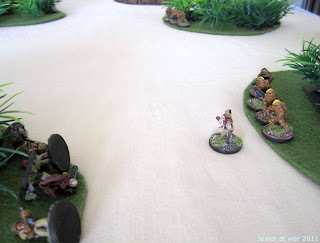 Blacksmith was the only survivor of the patrol and was locked in melee with a Rebel squad, so he broke off and was shot in the back when he run towards his base. Thanks to he activated first, he managed to move out from the game board with Fast Movement and two Stun results, which were saved by his Star Power. Game Over. Mission was a total failure. Blacksmith is the only survivor, with a -1 Fame Point. Next mission will be defend with a new full squad.